The Georgia Arborist Association's annual Tree Climbing Championship nears its registration deadline, as the Saturday, March 10 event draws close. Skilled tree climbers from all over the metro Atlanta area will compete in a full day of fun and activity at the United Methodist’s Children’s Home, located at 500 South Columbia Drive in Decatur. The event begins at 7:30 AM, and could last till 5:00 PM. 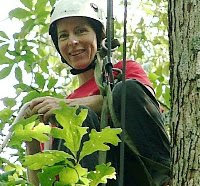 The event brings together tree climbing professionals, enthusiasts, and hobbyists for fellowship and friendly games. Contestants compete in five preliminary events to qualify as one of three finalists in the Masters Challenge championship. Preliminary events include: secured foot lock, belayed speed climb, aerial rescue, throw line, and work climb. The winner of the Masters challenge will be sponsored to the Southern Chapter ISA Tree Climbing Championship in Little Rock, Arkansas, March 25-27, 2007. Prizes will be awarded to winners of each event.